Danziger, who owns a marketing research and consulting company, dismisses people who worry that too much personal spending imperils individual financial security and crowds out public spending; she even cites the World Trade Center attacks to argue that overshopping is a patriotic duty. 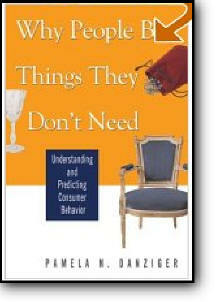 Right-thinking Americans, according to the author, encourage people to buy things they don't need by focusing on the shopping and ownership experience rather than on the good or service itself. This "sell the sizzle, not the steak" advice is not original, but this book elaborates on it by defining five types of consumers using 14 different "justifiers" to make unnecessary purchases; some of these are illustrated by a company that exploits the niche. The bulk of the book consists of statistical summaries of 37 different product areas. The sales approach is one-dimensional and described only in sketches, though the marketing text covers the theoretical ideas with more depth and balance. The book appears to be aimed at marketing consultants who need to brainstorm ideas in different product categories, and for this audience the author provides the enthusiasm to inspire proposals and enough data for the first draft. Within the past decade, the way consumers shop has undergone dramatic change; more options are now available, including the ease of shopping from home via the Internet. Beyond that, a dramatic shift has occurred—thanks in part to the drop in cost in buying essentials, discretionary purchases have taken the lead.